It was in the Serengeti when a pride of lion was lying in the grass, cubs playing and the females keeping an eye on the plains. This is just that incredible thing in the Serengeti that you can overlook the entire area and not only the lion can, also the photographer when looking out for photographic opportunities on a photo safari. We spotted the lion on a morning game drive and while watching and photographing them a herd of zebra approached. That was promising. Maybe we could witness a hunt! We retreated a bit from the scene to not disturb the animals and waited. The zebra herd was lead by a stallion. He walked in front of them scanning the area, head up and alert. 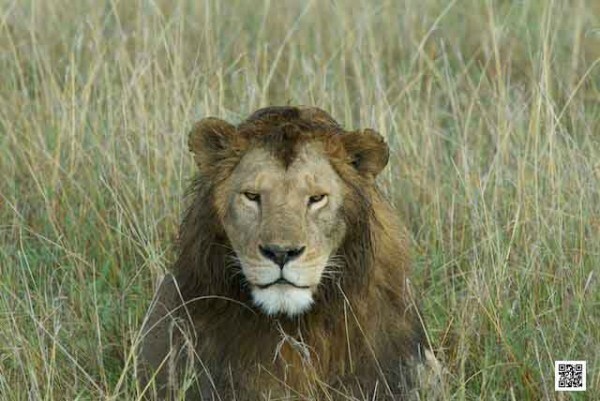 The lion pride had disappeared from earth as soon as they saw the zebras approaching. They were all down in the grass, no movement nothing at all to see of them. Nonetheless the leading zebra stopped about 60 meters away from the pride. The rest of the zebra herd just carried on grazing, but stayed behind the stallion, some of them even playing. The stallion and the herd stood there for at least 10 minutes and just at the moment that the stallion was about to carry on the big male lion of the pride popped up his head. He had been sleeping away from the females and cubs in the grass and had just woken up, wondering where his females are. When the stallion saw he male lion he stopped again, looked at him and them turned around and walked away where he came from. The herd followed him. There was no fast movement of any zebra, no panic, nothing and there was not attack of the lion. The females popped up their heads when the zebras had turned and walked away. Only one sub adult female an after the zebra, but only for a short distance. Nobody joint her. The lionesses are too wise to waste any energy. They knew they wouldn’t have a chance to catch a zebra, so they just carried on with what they were doing before the zebras arrived. This was an incredible sighting and we decided to stay with them, but move away for now to have some breakfast at a nearby rock. While having breakfast we saw that a buffalo heard was approaching the lion pride and the buffalos had a completely different strategy than the zebras. They had seen the lion and they immediately started attacking them, because they wanted access to a nearby water whole (probably the zebras also wanted to get to the water whole, but they do not have the strength of buffalos). The buffalo’s lion chase made that the pride was scattered over the whole area, which makes the weak. After a few moments also the lion seemed to realize that and organized themselves again. The buffalos were at the water whole drinking. The lion let their cubs under a distant group of trees and each lioness and young male lion took position on a termite mount. They set up an ambush for the buffalos for when they would leave the water whole. Ambush in this case meant that the lion had positioned themselves to take advantage of a hunting chance, but they were completely visible on the termite mounts. They were waiting. After quite a while the buffalos started moving off, but unfortunately for the lion in the wrong direction away from their positions. The lion left their termite mounts and met with the cubs under the trees. All were lying down in the grass again, again not wasting any energy. Later on in the afternoon, still at the same spot and still lying in the shade and the cubs playing, a heard of elephants approached. And also the elephants made clear that they don’t want the lion around and chased them away. The lion moved off and lied down in the grass away from the elephants. They knew there was no hunting opportunity and again they saved their energy for better opportunities probably occurring during the night. This entry was posted on Thursday, September 13th, 2012 at 12:39 pm. It is filed under Animals / Wildlife, Stories and tagged with elephant, game drive, lion, lion kill, photo safari, serengeti, sighting, tanzania. You can follow any responses to this entry through the RSS 2.0 feed.